DATE: JUNE 21, 2019, 8:00 P.M. – JUNE 22, 2019, 8:00 A.M. Registration closes at midnight on June 15, 2019. 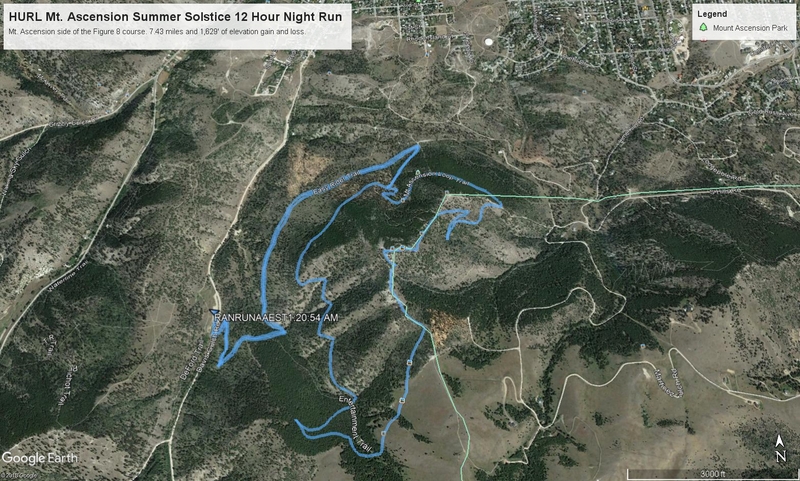 DESCRIPTION: The course is a modified figure 8 loop on Helena’s South Hills trails (Mount Ascension and Rodney Ridge areas). Each figure 8 is 100% singletrack, 11.57 miles, and 2,645 feet of elevation gain per figure 8. You’ve got 12 hours to cover as many complete loops as possible. You don’t have to run all night, one complete figure 8 loop anytime during the 12 hours and you are a finisher. You don’t have to run continuously. Do one loop, then go sleep somewhere, go dancing, etc., and come back later for another loop. Even though this event takes place just outside the City of Helena, this is Montana so do not assume that you won’t run into wildlife. Deer, black bear, and mountain lion have been seen along these trails. Also, being Montana trails, there are plenty of rocks out there. It’s a HURL event, we can’t make it easy on you! RULES: Runners must complete the Mt Ascension loop (clockwise), and then the Rodney Ridge loop (counterclockwise). The Overall and age division winners are determined first by mileage covered, as outlined below, then by time. Runners must complete one full figure 8 to be an official finisher. Each completed figure 8 counts as 11.5 miles, the Mt. Ascension loop counts at 7.5 miles and the Rodney Ridge loop counts as 4 miles. There is no mileage credit for partial loops.On your last time out, you can either complete the Mt. Ascension or Rodney Ridge loop only, rather than the full figure 8, and it will count towards your mileage total. Runners finishing a complete figure 8 after 6:00 a.m. will only be allowed to continue on the Rodney Ridge loop. All full Rodney Ridge loops completed after 6:00 a.m. will count towards your mileage total. Anyone claiming they have been running but have really been hiding in the porta potty (or found to be cheating in any other way) will be locked in a porta potty and hauled off inside it. RACE CHECK-IN: Begins at 7:00 p.m. at the starting area. We will conduct a race briefing at 7:45 p.m. COURSE MARKINGS: The course will be marked with ribbons, signs, reflective tape, and glow sticks. AID STATIONS: There will be an aid station at the Old Shooting Range Trailhead. It will be stocked with typical aid station food, HEED, Perpetuem, Hammer Gel, water, plus soup, coffee, and hot chocolate. Stay (or come back for) the awards for pancakes and bacon! AGE DIVISIONS: Male and Female solo divisions as follows: Open (0-39); Masters (40-49); Grand Masters (50-59); Super Masters (60-69); Super Grand Masters (70-79). If anyone over 80 signs up we’ll create an age division for you. AWARDS: To be determined. Awards will be as soon after 8:00 a.m. as possible. Pancakes and bacon will be served. Bring your own chair. REFUND POLICY: $30 of the entry fee is refundable for requests received prior to June 1. No refunds will be made after May 31. ROLLOVER POLICY: We will roll over your registration to the following year for requests received prior to June 1 of the year for which you initially registered. No rollovers will be made for any reason after May 31. You will be required to pay a $10 rollover fee when registering the for the following year’s event.Rollovers are only good for the next year’s race. Disclaimer: While we expect to continue this event in subsequent years, it is not guaranteed. If you chose to rollover your entry and there is no event the following year, you are not entitled to any refund. DIRECTIONS TO OLD SHOOTING RANGE TRAILHEAD: South on Davis Street. At edge of town it turns into a well maintained dirt road. Continue to the road approximately 1 mile from the edge of town and the parking area will be on your right. Mt. Ascension Loop: From the Old Shooting Range Trailhead up the Entertainment Trail, Archery Range Trail, Easy Rider Trail, 2006 Trail, Mt. Ascension Loop Trail, Entertainment Trail, Entertainment Alternative, Aftershock Trail, 2006 Trail, Easy Rider Trail, Archery Range Trail and Entertainment Trail back to the Old Shooting Range Trailhead. 7.5 miles, 1,630 feet of elevation gain, 1,630 feet of elevation loss. Rodney Ridge Loop: From the Old Shooting Range Trailhead up the Rodney Meadow Trail, Waterline Trail, T.R Trail, Pinchot Trail, Rodney Ridge Trail, Rodger Fuchs Trail, Rodney Meadow Trail back to the Old Shooting Range Trailhead. 4.0 miles, 1,015 feet of elevation gain, 1,015 feet of elevation loss.